When Kimberly McCullough signed on the dotted line last fall to return to General Hospital as Robin everyone knew from the jump that it was going to be a short term thing. After portraying Robert Scorpio and Anna Devane’s daughter on and off for more than 25 years, Robin can probably come and go as she pleases from the show. While most every soap character can be recast, Kimberly is about as safe as it gets from that ever happening to her beloved Robin. As she put it recently, every character can be recast bust some just shouldn’t be. 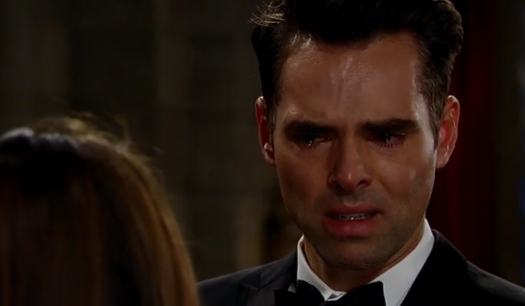 So as Robin left presumably to find and bring back the character of Jason, writers’ were left with the task of figuring out what to do with her onscreen husband, Patrick (played by Jason Thompson). The last time that Kimberly left, Robin was presumed dead and so Patrick went through the whole grieving process. This time the writers have decided that in order to keep him front and center and to keep his story moving they will have him involved in other story lines rather than having the loss of Robin be his story line. According to the March 17th print edition of Soap Opera Digest Kimberly is well aware of how much the fans want a happy ending for Robin and Patrick but she is glad that they don’t have that. It means that Jason gets to keep doing a bang up job as Patrick onscreen. He started off as filler and thanks to Jason’s portrayal, Patrick has turned into a central character and Kimberly would hate to see him fired in order to give Robin and Patrick a happy ending. Do you agree with her? Are you glad that Patrick is sticking around Port Charles even though his wife is gone again? Tell us your thoughts in the comments below! General Hospital Spoilers – Robin Scorpio Finds Jason Morgan Alive – What About Silas’s Wife Nina?